The mark of a great leader is their ability to withstand the inevitable trials of leadership. The greater your call, the greater these tests will be. Larry Kreider, International Director of DOVE International, offers Biblical wisdom for standing strong through the storms. Whether you are a leader in your home, work, community, or church, this book is your resource for not only surviving the trials of leadership, but welcoming them! Prepare for the coming tests. Leverage problems to develop maturity. Grow in humility through success. The storms are coming! Learn to stand strong through them all! “Allow the Lord to develop your attitude, character, gifts, and talents as you face the challenge of passing the tests leadership in your family, business, community, and church experiences. 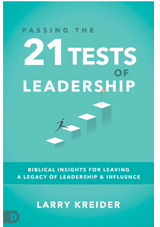 “It is wonderful to be able to endorse this book on the 21 tests of leadership. In a day where so many excuses are made for people who fail in qualification, we now have a trustworthy presentation of the standards we should establish for leaders. Bravo, Larry, for another important contribution.” —Daniel Juster, Th. D, Director Tikkun International. Author of Due Process and other books.